You can do hypothesis tests for three specific scenarios: testing one population proportion; testing for a difference between two population proportions; and testing for a difference between two population means. Solve the following problems about testing one population proportion. Note from JM: This isn’t quite accurate. You can also test one population mean. A bank will open a new branch in a particular neighborhood if it can be reasonably sure that at least 10% of the residents will consider banking at the new branch. The bank will use a significance level of 0.05 to make its decision. The bank does a survey of residents of a particular neighborhood and finds that 19 out of 100 random people surveyed said they’d consider banking at the new branch. Run a z-test for a single proportion and determine whether the bank should open the new branch, considering its standard policy. Answer: The null hypothesis should be rejected; the bank should open the new branch. Note: Because the bank wants to ensure that at least 10% of the residents will use the new branch, it’s implicitly interested in a greater than alternative hypothesis. Next, determine whether the sample is large enough to run a z-test by checking that both np0 and n(1 – p0) equal at least 10. In this case, n = 100 and p0 = 0.10, so np0 = (100)(0.10) = 10, and n(1 – np0) = 100(1 – 0.10) = 100(0.90) = 90. 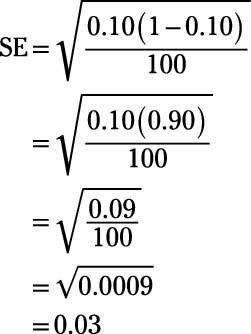 Next, find the observed proportion by dividing the number who said they would consider banking at the new branch by the sample size of 100: 19/100 = 0.19.
is the observed proportion, p0 is the hypothesized proportion, and SE is the standard error. Now, use a Z-table to determine the probability of observing a z-score this high or higher. 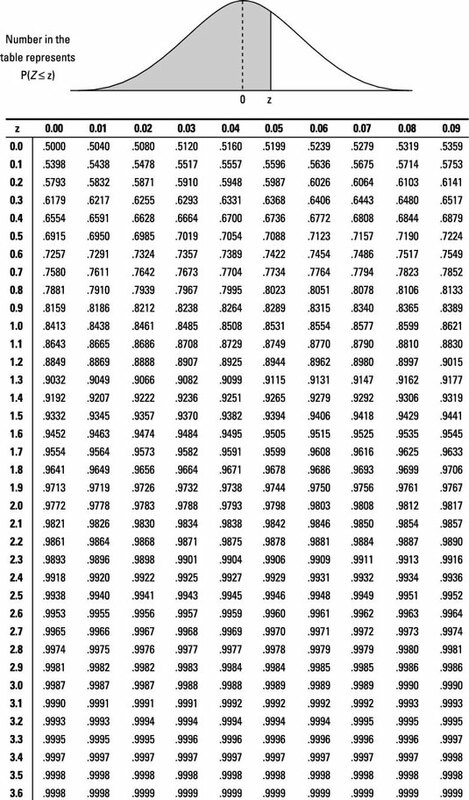 Unfortunately, the table shows the probability of observing a score of z = 3.0 or lower, so you have to subtract the table probability from 1 to get the probability: 1 – 0.9987 = 0.0013. Finally, compare the probability (that is, the p-value) with the alpha level. The bank wanted to use a significance level of 0.05, so alpha = 0.05, and the p-value of 0.0013 is much lower than that. So you reject the null hypothesis. A corporate call center hopes to resolve 75% or more of customer calls through an automated computer voice recognition system. It randomly surveys 50 recent customers; 45 report that their issue was resolved. Can the management of the corporation conclude that the computer system is hitting its minimum target, using a significance level of 0.05? Use a z-test for a single proportion to provide an answer. Answer: The null hypothesis should be rejected; the standard has been met and exceeded. Note: The alternative is a greater than hypothesis because the call center sets a minimum threshold for performance and is asking only whether the system meets or exceeds the threshold with a high degree of confidence. Then, determine whether the sample is large enough to run a z-test by checking that both np0 and n(1 – p0) equal at least 10. 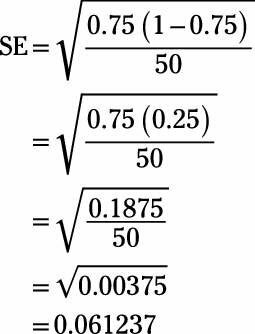 In this case, n = 50 and p0 = 0.75, so np0 = 50(0.75) = 37.5, and n(1 – p0) = 50(1 – 0.75) = 50(0.25) = 12.5. Next, find the observed proportion by dividing the number of “successes” by the sample size: 45/50 = 0.90. Now, use a Z-table to figure out the probability of observing a value this high or higher (because the alternative is a greater than hypothesis). 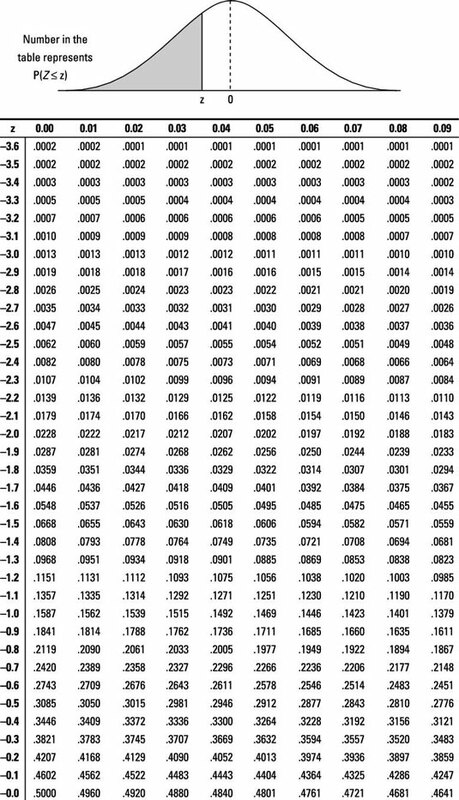 The table gives you the proportion of the area under the curve that’s less than a given value of z, which is 0.9929. To get the desired area (proportion above this z-value), you have to subtract that number from 1: 1 – 0.9929 = 0.0071. Finally, identify the desired alpha level (0.05) and compare the probability you found from the Z-table with that. Because 0.0071 is less than 0.05, you reject the null hypothesis.